Traumatic brain injuries unfortunately are common occurrences and are ranked as one of the most prevalent injuries in our society today. TBI, as it is termed, is a major public health concern, especially in younger males and people in their elder years. Some of the most common causes of TBI for civilians include falls, motor vehicle crashes, being struck by objects or hitting against an object, and assaults. In 2010, 2.5 million TBI-related emergency room visits, hospitalizations, or deaths were recorded (Source: Centers for Disease Control and Prevention). 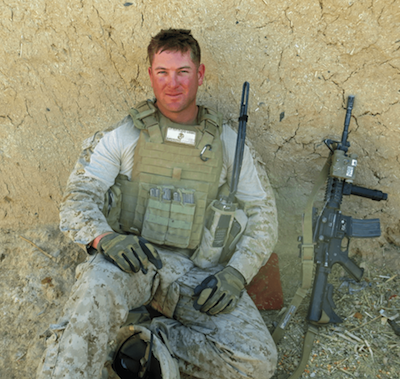 TBIs have also become one of the signature wounds of our combat veterans in military deployment in the Middle East. Of the approximate 2.5 million U.S. troops who deployed to Afghanistan or Iraq, it is estimated by study teams that a significant percentile suffers from some degree of concussion and post-traumatic stress. 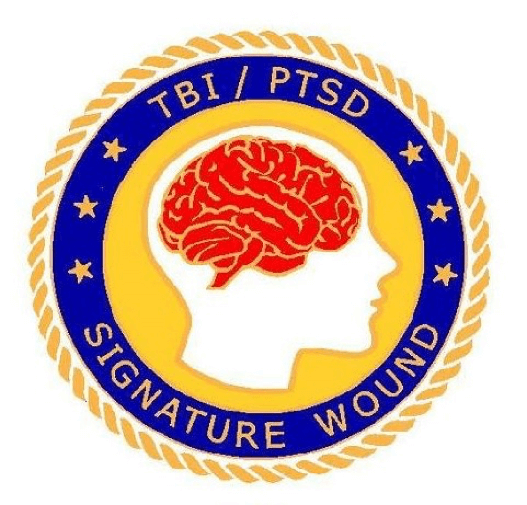 TBIs, PTSD, and accompanying depression generally follow deployment, and almost thirty percent of combat veterans experience both TBI and PTSD, the signature wounds of our present-day wars—and what yesterday’s combat veterans knew as “shell-shock” and “battle-fatigue.” Unfortunately, most of these wounds remain untreated and misunderstood. IEDs, one of the deadlier weapons devised, cause scores of mild to severe traumas for returning combat veterans. Those veterans who experience these wounds are all too familiar with IEDs and other concussive blasts. 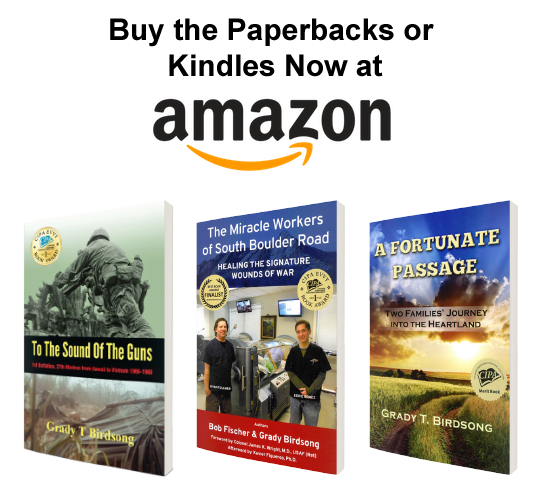 The author’s son, Marine Sergeant Shane Birdsong, an infantryman, recorded two such blasts while on his first tours in Iraq. 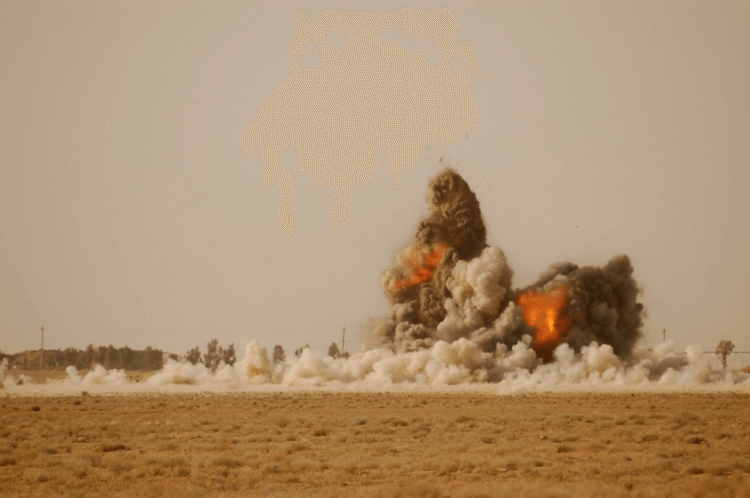 The photo below (Figure 1) shows a controlled blast by Marine combat engineers to destroy enemy ordnance found in an area while patrolling. This particular photo shows the magnitude of explosives in an IED cache that are typically discovered. The next photo (Figure 2) depicts a less fortunate mobile patrol in Anbar Province, Iraq. 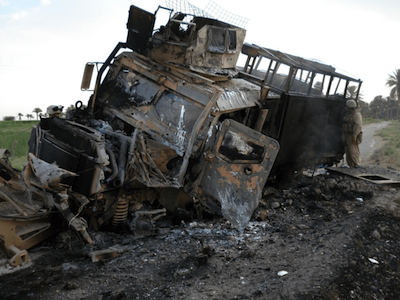 This squad, while on patrol, took the full impact of a buried command-detonated IED that destroyed the vehicle and wounded all occupants—the driver, the squad leader, the A-gunner, and eight Marine infantrymen in the rear of the truck. All were medically evacuated with moderate to severe physical wounds and TBIs. All the Marines survived. The IED consisted of an explosive wired to a 155-artillery round and propane tank. The propane tanks used in these IEDs are like a normal American BBQ grill propane tank, which can produce horrendous concussive force if ignited by explosives. Brain damage from such blasts results in both physical and psychological injuries that regular, pill-driven medicine attempts to treat and heal. Yet, rather than prescribing drugs, we believe there are better ways to address these injuries, which is what is being done at the Rocky Mountain Hyperbaric Institute. Before we continue further to present the benefits and success of HBOT, however, it is important to first consider the brain and its complexity. Only then can we examine just how oxygen treats and heals TBI and also facilitates the treatment of PTSD. The most fragile, complex, and vulnerable organ in the body is the human brain. It controls our thoughts, emotions, behavior, movements, and sensations. It processes what we think, feel, and create with its billions of neurons and their dendrite forest. They work together to receive and exchange data and then act as the interpreter of our senses to control and direct all our movements. Even our sleep and breathing depend on this healthy condition. Each of the brain’s five lobes has specific functions that we depend on to live, function, and experience life. The brain’s gelatinous mass is encased in a hard skull for protection (Figure 3). It wards off mild concussions and blows to the head that injure us when we fall or “have our bell rung” in a boxing ring. 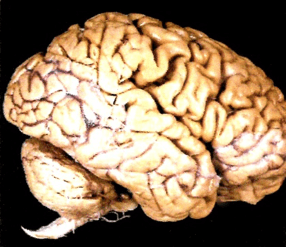 In his description of the human brain and how it functions, hyperbaric treatment pioneer Dr. Paul Harch employs a brain-sized stalk of broccoli (Figure 4), as he shows its many thousands of tendrils and then describes how a brain’s dendrite forest reacts to a hard blow or a serious IED blast (see Figures 1 & 2). 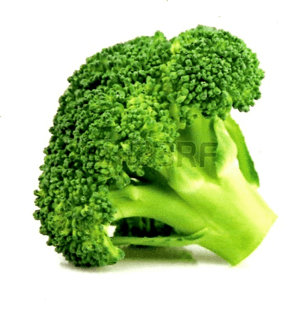 If we carefully examine broccoli we see these many tiny tendrils (Figure 4) that are similar to the dendrite forests of the brain (Figure 5). 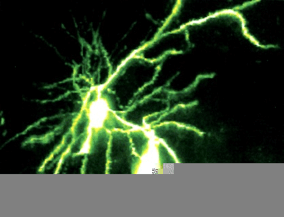 The brain has billions of neuron cells that anchor their branched projections, the dendrites. They, in turn, propagate—sending and receiving electro-chemical stimuli—and act as antennae or receptors of signals from other nerve cells. The human body and all its physical and emotional functions depend on the healthy performance of these critical brain elements. When they are damaged from a blow or concussive brain injury they either die or shut down. Recent brain studies have confirmed that the brain has an amazing capacity to recover and the brain’s own plasticity generates brand new dendrites that replace the dead ones or revitalize the dormant ones. Spectrographic scans taken of a veteran’s concussion-damaged brain show areas of injury to the lobes and their dendrite forests. As we confirm with our HBOT treatment, concentrated oxygen not only treats and heals a damaged brain but stimulates and activates the brain’s own ability to heal itself. Recent Israeli neuroplasticity studies of veterans with TBI confirm this process. 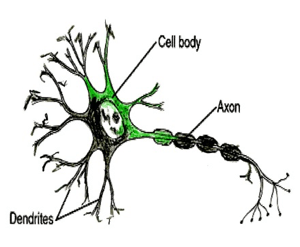 The brain is composed of eighty billion dendrites that are anchored in their neuron bodies. They are the primary receptors for our brain’s information and together they control and coordinate our body’s many functions. In effect, they are the main elements of the brain’s computer. The human brain is designed to ward off minor blows, such as from a fall or as a result of being shaken in an accident. The brain mass actually bounces off the inside skull wall and in most cases, is saved from any injury. A serious blast or concussion, however, sends shockwaves through the brain mass with such intensity that many dendrites and neurons either shut down or die as a result of the severe shock. Oftentimes, these dendrites survive severe damage and go dormant until the proper type of medical treatment revives and restores their lost functions. (Figure 6). For several centuries, it has been proven that oxygen heals wounds and destroys parasites. Oxygen has been employed for more than 100 years by the U.S. Navy to treat and heal nitrogen narcosis, or the “bends,” as it is better known. Major hospitals today employ hyperbaric chambers for a large number of FDA-approved maladies, as shown in the following list: air or gas embolism, carbon monoxide poisoning, gas gangrene, crush injury, decompression sickness, arterial insufficiencies (category of diabetic foot ulcers), severe anemia, intracranial abscess, necrotizing soft tissue infections, osteomyelitis, delayed radiation injury, comprised skin graphs and flaps, thermal burn injury, and idiopathic sudden sensorineural hearing loss. 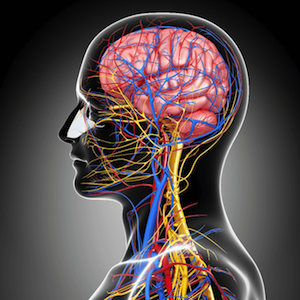 An important Israeli study, documented and published in 2013 by a distinguished team of researchers drawn from Tel-Aviv University, The Assaf Harofeh Medical Center, and the Institute of Hyperbaric Medicine, Zerifin, Israel, tested and documented the brain’s capacity to heal itself in at least two cases.1, 2 Called neuroplasticity, it is the brain’s unique ability to overcome and eliminate injuries and tissue damage with the right stimulus, such as the brain’s exposure to hyperbaric oxygen, which actually heals and restores life to damaged cells. Blood flow is critical to human life and bodily functions. The brain is no exception, and its own complexity requires even greater attention than other organs and wound areas. Interruption of blood flow to parts of the brain can result in strokes, seizures, and other impairment, which is why the timely HBOT treatment of veterans who suffer from TBI and PTSD is extremely critical, especially when there is proof that oxygen-based therapy really does heal and restore the combat veteran’s body and mind. An adequate supply of oxygen and nutrients is critical for all human cells and tissues. Nurturing the proliferation of the below processes with pressurized oxygen has been found to accelerate healing of traumatized areas in the brain. Angiogenesis: The development of new blood vessels from pre-existing vessels. It occurs in the healthy body for healing wounds and restoring blood flow in damaged tissues after injuries. Neovascularization: The formation of functional microvascular networks (blood paths) in red blood cell perfusion. It differs from angiogenesis, which is characterized by profusion and outgrowth of capillary buds and sprouts from preexisting blood vessels. Hyperbaric oxygen stimulates both. Each veteran who is treated at the Rocky Mountain Hyperbaric Institute receives a concentrated oxygen brain bath for forty hours, one hour at a time. The following schematic shows what happens inside the damaged brain when oxygen is introduced at 1.5 atmospheres (the equivalent of 17 feet below sea level at a 5,000-foot altitude). 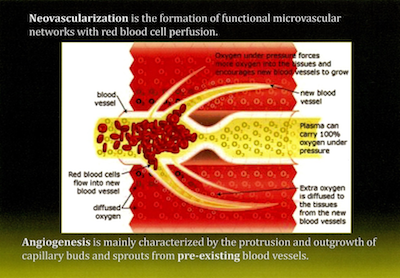 The oxygen healing process includes both angiogenesis and neovascularization, as defined above. The damaged dendrites, blood cells, and pathways are either bypassed, if the cell or dendrite is dead, or can also be revitalized if in a dormant state (Figure 8). Flashbacks – reliving the trauma over and over, including the experience of physical symptoms like a racing heart or sweating. Words, objects, or situations can trigger these symptoms. Bad dreams and frightening thoughts that may cause problems in everyday life. Staying away from places, events, or objects that trigger experience reminders. Feeling emotionally numb, with strong guilt, depression, or worry predominant. Little interest in activities that were enjoyable in the past—before the trauma. Having trouble remembering or recalling the dangerous or terrifying event. Easily startled, to the extent that a person may change their personal routine. Feeling tense or “on edge,” which can lead to more stress and angry outbursts. Inability to function normally to do basic daily tasks, usually with little sleep. When the injured veteran arrives for treatment, it is common to find that they suffer from many of the symptoms listed above. Their disrupted sleep, serious memory loss, mood swings, and withdrawal-depression require the immediate attention of the clinic staff. Many do not communicate at all or lack the ability to speak clearly or even pay attention to their first instructions. They must be counseled and gently led through each TBI and PTSD treatment step until each of them becomes familiar with and trusts the clinic’s medical director, the HBOT technicians, the PTSD counselor, and the chamber operators. At first, it is a foreign environment and can be quite intimidating. Today, more than 250 healed veterans can now attest to the professional and successful TBI and PTSD therapy they experienced in the only integrated TBI and PTSD treatment program in America. When each veteran started the program, it was obvious that they suffered some degree of brain damage from their combat concussions or other injuries. In too many cases, they had suffered their signature wounds for far too long and their families and friends had suffered along with them. Their brain injuries went virtually untreated and unhealed until they sought help at the Rocky Mountain Hyperbaric Institute. 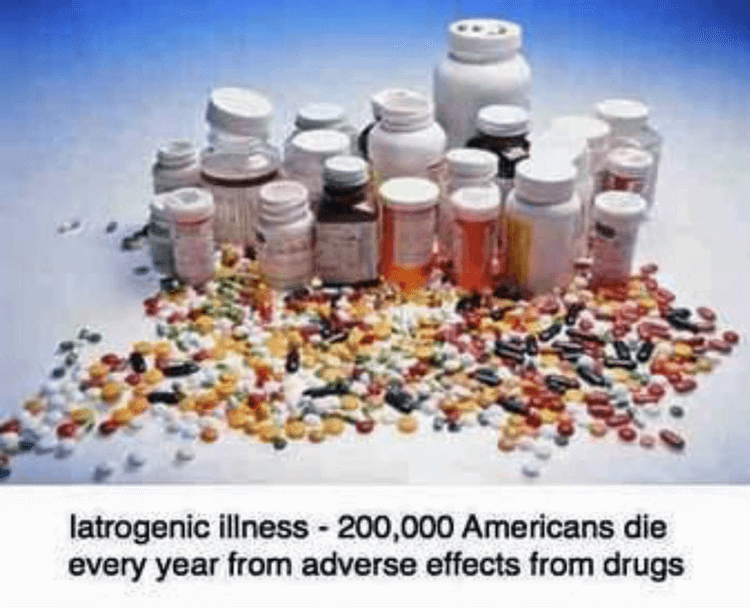 When they arrived at the clinic, a large segment of them were actual “basket cases.” Most were doped up on useless off-label medicine, aka “black drugs,” the majority of which had not yet been approved or tested by the FDA. Some veterans arrived with many different prescriptions, as if more of these pills would somehow help them feel better. The need for additional health services, especially for neurotrauma, has skyrocketed in recent years. And it likely will increase even more significantly as time goes forward. 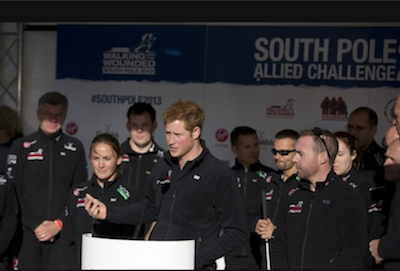 Invisible wounds have become the signature wounds of this generation and these combat veterans. This brings us to our story … the miracle that is happening on South Boulder Road in Louisville, Colorado. 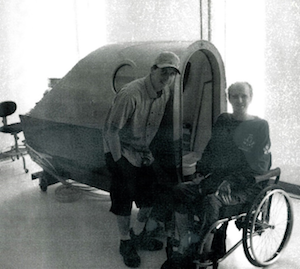 Ryan Fullmer, the program director, Rocky Mountain Hyperbaric Institute, has partnered with Eddie Gomez, President, Patient and Nonprofit Services, Rocky Mountain Hyperbaric Association for Brain Injuries, to treat and heal traumatic brain injuries. 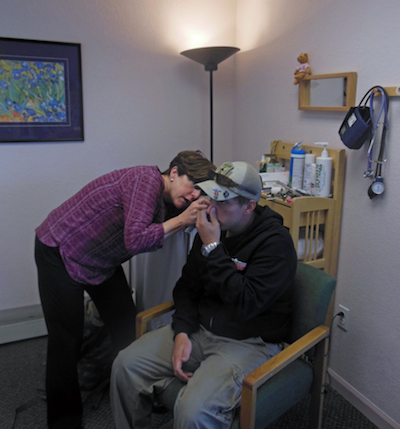 They also integrate PTSD counseling within the same TBI treatment period, usually over a period of forty days. This is one of the most imaginative and successful programs of its kind in the United States and combines the treatment of the two maladies under one comprehensive treatment process. Before we move into some of the amazing stories of recovery that have occurred at the Rocky Mountain Hyperbaric Institute, we’d like to first introduce you to this miracle team.